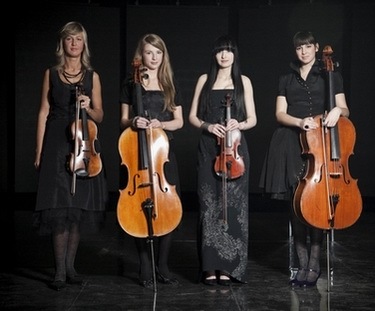 Urban Symphony are lead singer and violinist Sandra Nurmsalu, violinist Mann Helstein, cello players Johanna Mangel, Mari Moldre. They are joined by backing vocalists Mirjam Mesak and Marilin Kongo. Sandra Nurmsalu's life has always been full of music. Her first memory of comes from the home. "We had at home an old synthesizer, father played on it and I sang and mother has been recording it on tape". The girl's first music teacher was Juta Helilaid. It was Juta who suggested Sandra to start learning violins, which she is playing for ten years now. From early age Sandra also started writing own songs "I wanted to create something great, but was missing a lot of skills", admits singer. Band Urban Symphony was first created as a one-time project with aim to record Metallica song "Nothing Else Matters" in a strings version. Thus, Sandra has invited her friends Mann and Johanna to join her. They proceeded recording Kosheen's "Hungry" and seeing it goes well, girls have decided to continue as group and have invited another member, Mari. 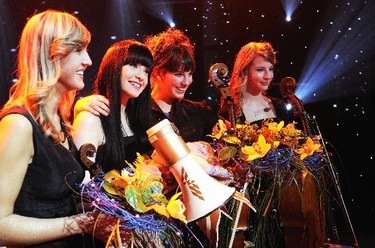 At the show "Kaks takti ette" Sandra was noticed by composer and producer Sven LГµhmus (composer of Estonian 2005 entry) who suggested her and girls to start cooperation. 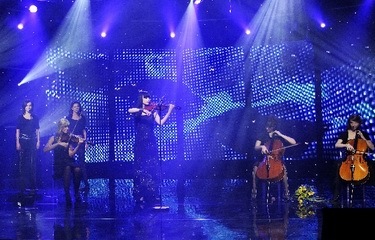 Eesti Laul marked first public performance of the band. "We were not thinking about vicotry, but have done our best and it's great that this was enough to win", said happy Nurmsalu. "At any stage there is simple rule: to concentrate on music and play it with you heart. So, it is not really different to me - to sing on a big stage in Moscow, or at home to mom and dad", she added. Urban SymphonyвЂ™ singer is Sandra Nurmsalu. 20-year-old Sandra has two passions вЂ“ singing and violin playing and Urban Symphony has given her the chance to combine these. 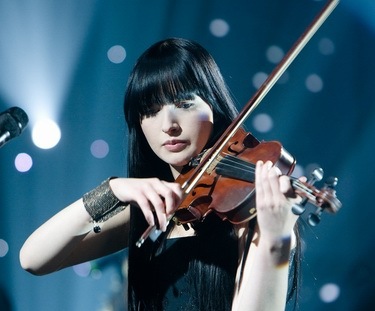 Ten years of violin studies in classic music have also taken her to the roots of Estonian folk music вЂ“ for seven years, she played and sang in folk group Pillipiigad giving concerts and performing at festivals all over Estonia and in Europe. For 3 years she has also been part of folk band Virre. Johanna Mangel is 18 years old and cello studies have been part of her life for twelve years. Outside her classical music studies, Johanna has thanks to her inherent curiosity played cello not only in various local and international orchestras, but also in rock bands вЂ“ well-known Estonian bands Aides, Slide-Fifty, Vennaskond. Besides playing musical instruments, Johanna is interested in composing, fashion and film, and she also writes critical reviews of various music events for music magazines. The baby of the band is the 16-year-old Mari Moldre, who started practicing cello already at the age of six. Despite her young age, she has always been dedicated to music, for besides cello playing she has been involved in singing and piano playing, taken part in various projects and been a part of several musical collectives. Numerous performances have taken her to different places in the world вЂ“ even Australia! When she has time left over from school and music activities, Mari takes an interest in architecture and drawing. Mann Helstein is Urban SymphonyвЂ™s viola player. 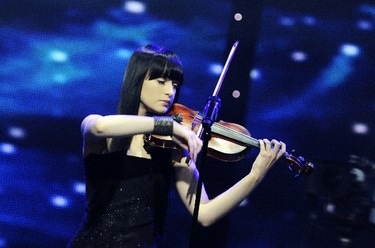 She started her studies at the age of ten, learning to play violin. By today, the 21-year-old Mann has as a member of various international orchestras travelled all over Europe. In addition, she is currently studying quality and environmental management. Back vocal singer Marilin Kongo is 22. She got introduced to music through dancing, which she has been practicing since the age of five. In addition to dancing and singing, she is very closely engaged in a multitude of musical projects. The 18-year-old Mirjam Mesak is also singing back vocals. She has been actively involved in music for ten years and at the moment she is studying classic song besides preparing to finish secondary school. Mirjam first appeared on the Eurovision Song Contest stage at the age of twelve, when she was part of an interval act at the Eurovision Song Contest held in Tallinn in 2002. In Helsinki in 2006, Mirjam sang back vocals to Gerli Padar in the Estonian entry Partners In Crime. Sven LГµhmus (36) is one of the most productive pop music composers and producers in Estonia. Sven has his own record and marketing company Moonwalk. One of his creations, VANILLA NINJA, made it on the European music market and represented Switzerland at the Eurovision Song Contest in Kiev. Sven has taken part in the Estonian Eurovision contest in several years and his songs have become the favourites of the public. The first to win was girl band SUNTRIBE with "LetвЂ™s Get Loud". Listen to the winning song RГ¤ndajad here and watch preview video here. Performance at the "Paar" show is available here. "We all are travellers, and walk through our own choice", Sandra describes her song. 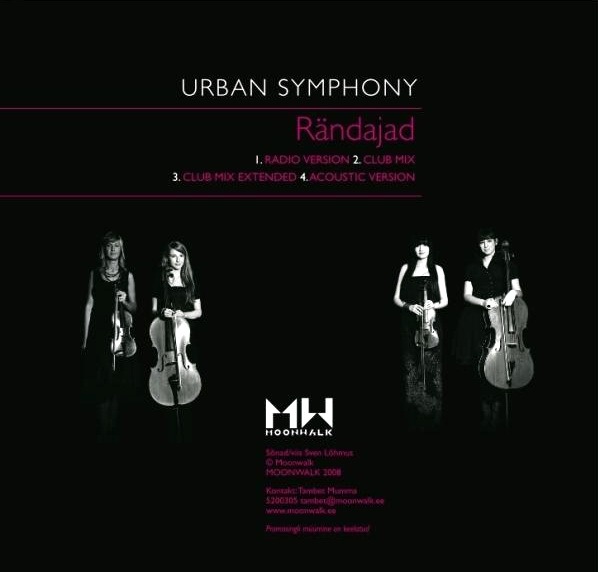 RГ¤ndajad - Club Mix Extended Urban Symphony СЌС‚Рѕ РїРµРІРёС†Р° Рё СЃРєСЂРёРїР°С‡РєР° Sandra Nurmsalu, СЃРєСЂРёРїР°С‡РєР° Mann Helstein, РІРёРѕР»РѕРЅС‡РµР»РёСЃС‚С‹ Johanna Mangel, Mari Moldre. РЎ РЅРёРјРё РІС‹СЃС‚СѓРїР°СЋС‚ Р±СЌРє-РІРѕРєР°Р»РёСЃС‚С‹ Mirjam Mesak Рё Marilin Kongo. Р–РёР·РЅСЊ РЎР°РЅРґСЂС‹ РќСѓСЂРјСЃР°Р»Сѓ Р±С‹Р»Р° РІСЃРµРіРґР° РЅР°РїРѕР»РЅРµРЅР° РјСѓР·С‹РєРѕР№. Р•Рµ РїРµСЂРІС‹Рµ РІРѕСЃРїРѕРјРёРЅР°РЅРёСЏ: "РЈ РЅР°СЃ РґРѕРјР° Р±С‹Р» СЃС‚Р°СЂС‹Р№ СЃРёРЅС‚РµР·Р°С‚РѕСЂ, РїР°РїР° РёРіСЂР°Р» РЅР° РЅРµРј, СЏ РїРµР»Р°, Р° РјР°РјР° Р·Р°РїРёСЃС‹РІР°Р»Р° СЌС‚Рѕ РЅР° РєР°СЃСЃРµС‚С‹". РџРµСЂРІС‹Рј РјСѓР·С‹РєР°Р»СЊРЅС‹Рј СѓС‡РёС‚РµР»РµРј РЎР°РЅРґСЂС‹ Р±С‹Р»Р° Р®С‚Р° РҐРµР»РёР»Р°Рґ. РћРЅР° Рё РїСЂРµРґР»РѕР¶РёР»Р° РЎР°РЅРґСЂРµ РЅР°С‡Р°С‚СЊ Р·Р°РЅРёРјР°С‚СЊСЃСЏ СЃРєСЂРёРїРєРѕР№, РЅР° РєРѕС‚РѕСЂРѕР№ РѕРЅР° РёРіСЂР°РµС‚ СѓР¶Рµ 10 Р»РµС‚. РЎ СЂР°РЅРЅРµРіРѕ РґРµС‚СЃС‚РІР° РЎР°РЅРґСЂР° РЅР°С‡Р°Р»Р° РїРёСЃР°С‚СЊ Рё СЃРѕР±СЃС‚РІРµРЅРЅС‹Рµ РїРµСЃРЅРё "РЇ С…РѕС‚РµР»Р° СЃРѕР·РґР°С‚СЊ С‡С‚Рѕ-С‚Рѕ Р±РѕР»СЊС€РѕРµ, РЅРѕ РјРЅРµ РЅРµ С…РІР°С‚Р°Р»Рѕ СѓРјРµРЅРёСЏ", РїСЂРёР·РЅР°РµС‚ РїРµРІРёС†Р°. Р“СЂСѓРїРїР° Urban Symphony Р±С‹Р»Р° СЃРѕР·РґР°РЅР° РІ РЅР°С‡Р°Р»Рµ РІ РєР°С‡РµСЃС‚РІРµ РѕРґРЅРѕСЂР°Р·РѕРІРѕРіРѕ РїСЂРѕРµРєС‚Р° СЃ С†РµР»СЊСЋ Р·Р°РїРёСЃР°С‚СЊ РїРµСЃРЅСЋ РњРµС‚Р°Р»Р»РёРєРё "Nothing Else Matters" РІ СЃС‚СЂСѓРЅРЅРѕРј РІР°СЂРёР°РЅС‚Рµ. Р”Р»СЏ СЌС‚РѕРіРѕ РЎР°РЅРґСЂР° РїСЂРёРіР»Р°СЃРёР»Р° СЃРІРѕРёС… РїРѕРґСЂСѓРі РњР°РЅРЅ Рё Р™РѕС…Р°РЅРЅСѓ РїСЂРёСЃРѕРµРґРёРЅРёС‚СЊСЃСЏ Рє РЅРµР№. Р—Р° СЌС‚РёРј РїРѕСЃР»РµРґРѕРІР°Р»Р° Р·Р°РїРёСЃСЊ РїРµСЃРЅРё Kosheen "Hungry" Рё РґРµРІСѓС€РєР°Рј С‚Р°Рє СЌС‚Рѕ РїРѕРЅСЂР°РІРёР»РѕСЃСЊ, С‡С‚Рѕ РѕРЅРё СЂРµС€РёР»Рё РїСЂРѕРґРѕР»Р¶Р°С‚СЊ СЂР°Р±РѕС‚Р°С‚СЊ РІРјРµСЃС‚Рµ РєР°Рє РіСЂСѓРїРїР° Рё РїСЂРёРіР»Р°СЃРёР»Рё С‡РµС‚РІРµСЂС‚РѕРіРѕ С‡Р»РµРЅР° - РњР°СЂРё. "РћС‚С†РѕРј" РіСЂСѓРїРїС‹ Рё РїРµСЃРЅРё-РїРѕР±РµРґРёС‚РµР»СЏ СЃС‚Р°Р» РїСЂРѕРґСЋСЃРµСЂ Рё РєРѕРјРїРѕР·РёС‚РѕСЂ РЎРІРµРЅ Р›С‹С…РјСѓСЃ (Р°РІС‚РѕСЂ Р­СЃС‚РѕРЅСЃРєРѕР№ РїРµСЃРЅРё РЅР° Р•РІСЂРѕРІРёРґРµРЅРёРё 2005), Р·Р°РјРµС‚РёРІС€РёР№ РїСЂРёРµС…Р°РІС€СѓСЋ РёР· РђР»Р°РІРµСЂРµ РќСѓСЂРјСЃР°Р»Сѓ РЅР° С‚РµР»РµРїРµСЂРµРґР°С‡Рµ "Kaks takti ette". Р’С‹СЃС‚СѓРїР»РµРЅРёРµ РЅР° Eesti Laul СЃС‚Р°Р»Рѕ РїРµСЂРІС‹Рј РїСѓР±Р»РёС‡РЅС‹Рј РІС‹СЃС‚СѓРїР»РµРЅРёРµРј РіСЂСѓРїРїС‹. "РњС‹ Рё РЅРµ РґСѓРјР°Р»Рё Рѕ РїРѕР±РµРґРµ, РЅРѕ РІС‹Р»РѕР¶РёР»РёСЃСЊ РїРѕ РјР°РєСЃРёРјСѓРјСѓ Рё РµСЃР»Рё СЌС‚РѕРіРѕ РѕРєР°Р·Р°Р»РѕСЃСЊ РґРѕСЃС‚Р°С‚РѕС‡РЅРѕ РґР»СЏ РїРѕР±РµРґС‹, С‚Рѕ СЌС‚Рѕ РІРµР»РёРєРѕР»РµРїРЅРѕ", вЂ” СЃРєР°Р·Р°Р»Р° РќСѓСЂРјСЃР°Р»Сѓ. "РќР° Р»СЋР±РѕР№ СЃС†РµРЅРµ РґРµР№СЃС‚РІСѓРµС‚ РѕРґРЅРѕ Рё С‚Рѕ Р¶Рµ РїСЂР°РІРёР»Рѕ: РЅР°РґРѕ СЃРѕСЃСЂРµРґРѕС‚РѕС‡РёС‚СЃСЏ РЅР° РјСѓР·С‹РєРµ Рё СЃС‹РіСЂР°С‚СЊ СЌС‚Рѕ РѕС‚ РІСЃРµРіРѕ СЃРµСЂРґС†Р°. РџРѕСЌС‚РѕРјСѓ РјРЅРµ РІСЃРµ СЂР°РІРЅРѕ, РїРµС‚СЊ РІ РњРѕСЃРєРІРµ РёР»Рё РјР°РјРµ СЃ РїР°РїРѕР№", РґРѕР±Р°РІРёР»Р° РѕРЅР°. РЎРѕР»РёСЃС‚РєР° РіСЂСѓРїРїС‹ Urban Symphony - РЎР°РЅРґСЂР° РќСѓСЂРјСЃР°Р»Сѓ. 20-Р»РµС‚РЅСЏСЏ РЎР°РЅРґСЂР° Р»СЋР±РёС‚ РїРµС‚СЊ Рё РёРіСЂР°С‚СЊ РЅР° СЃРєСЂРёРїРєРµ Рё СѓС‡Р°СЃС‚РёРµ РІ РіСЂСѓРїРїРµ РґР°Р»Рѕ РµР№ РІРѕР·РјРѕР¶РЅРѕСЃС‚СЊ СЃРѕРµРґРёРЅРёС‚СЊ СЌС‚Рё РґРІРµ СЃС‚СЂР°СЃС‚Рё. Р”РµСЃСЏС‚СЊ Р»РµС‚ Р·Р°РЅСЏС‚РёСЏ СЃРєСЂРёРїРєРѕР№ РІ РєР»Р°СЃСЃРёС‡РµСЃРєРѕР№ РјСѓР·С‹РєРµ РїСЂРёРІРµР»Рё РµРµ Рє РёСЃС‚РѕРєР°Рј СЌСЃС‚РѕРЅСЃРєРѕР№ С„РѕР»СЊРєР»РѕСЂРЅРѕР№ РјСѓР·С‹РєРё - РІ С‚РµС‡РµРЅРёРё 7 Р»РµС‚ РѕРЅР° РёРіСЂР°Р»Р° Рё РїРµР»Р° РІ С„РѕР»Рє РіСЂСѓРїРїРµ Pillipiigad, РІС‹СЃС‚СѓРїР°СЏ РЅР° С„РµСЃС‚РёРІР°Р»СЏС… РІ Р­СЃС‚РѕРЅРёРё Рё Р·Р°СЂСѓР±РµР¶РѕРј. Р’ С‚РµС‡РµРЅРёРё 3С… Р»РµС‚ РѕРЅР° С‚Р°РєР¶Рµ РІС‹СЃС‚СѓРїР°Р»Р° СЃ С„РѕР»Рє-РіСЂСѓРїРїРѕР№ Virre. Р™РѕС…Р°РЅРЅРµ РњСЏРЅРіРµР» 18 Р»РµС‚ Рё СѓР¶Рµ 12 Р»РµС‚ РѕРЅР° СѓС‡РёС‚СЃСЏ РёРіСЂР°С‚СЊ РЅР° РІРёРѕР»РѕРЅС‡РµР»Рё. РџРѕРјРёРјРѕ Р·Р°РЅСЏС‚РёР№ РєР»Р°СЃСЃРёС‡РµСЃРєРѕР№ РјСѓР·С‹РєРё, Р±Р»Р°РіРѕРґР°СЂСЏ СЃРІРѕРµР№ Р»СЋР±РѕР·РЅР°С‚РµР»СЊРЅРѕСЃС‚Рё Р™РѕС…Р°РЅРЅР° РІС‹СЃС‚СѓРїР°Р»Р° РЅРµ С‚РѕР»СЊРєРѕ СЃ СЂР°Р·Р»РёС‡РЅС‹РјРё РјРµСЃС‚РЅС‹РјРё Рё РјРµР¶РґСѓРЅР°СЂРѕРґРЅС‹РјРё РѕСЂРєРµСЃС‚СЂР°РјРё, РЅРѕ Рё РІ СЂРѕРє-РіСЂСѓРїРїР°С…, С‚Р°РєРёС… РєР°Рє Aides, Slide-Fifty, Vennaskond. РџРѕРјРёРјРѕ РёРіСЂС‹ РЅР° РјСѓР·С‹РєР°Р»СЊРЅС‹С… РёРЅСЃС‚СЂСѓРјРµРЅС‚Р°С…, Р™РѕС…Р°РЅРЅР° РїРёС€РµС‚ РїРµСЃРЅРё, РёРЅС‚РµСЂРµСЃСѓРµС‚СЃСЏ РјРѕРґРѕР№ Рё РєРёРЅРѕ, Р° С‚Р°РєР¶Рµ РїРёС€РµС‚ РєСЂРёС‚РёС‡РµСЃРєРёРµ РѕР±Р·РѕСЂС‹ СЂР°Р·Р»РёС‡РЅС‹С… РјСѓР·С‹РєР°Р»СЊРЅС‹С… СЃРѕР±С‹С‚РёР№ РґР»СЏ РјСѓР·С‹РєР°Р»СЊРЅС‹С… Р¶СѓСЂРЅР°Р»РѕРІ. РЎР°РјР°СЏ РјРѕР»РѕРґР°СЏ СѓС‡Р°СЃС‚РЅРёС†Р° РіСЂСѓРїРїС‹ - 16С‚Рё Р»РµС‚РЅСЏСЏ РњР°СЂРё РњРµР»РґСЂРµ, РєРѕС‚РѕСЂР°СЏ РЅР°С‡Р°Р»Р° Р·Р°РЅРёРјР°С‚СЊСЃСЏ РЅР° РІРёРѕР»РѕРЅС‡РµР»Рё РІ РІРѕР·СЂР°СЃС‚Рµ 6 Р»РµС‚. РќРµСЃРјРѕС‚СЂСЏ РЅР° СЃРІРѕР№ СЋРЅС‹Р№ РІРѕР·СЂР°СЃС‚, РѕРЅР° РІСЃРµРіРґР° Р±С‹Р»Р° РїСЂРµРґР°РЅР° РјСѓР·С‹РєРµ, РїРѕРјРёРјРѕ РІРёРѕР»РѕРЅС‡РµР»Рё РїРµР»Р° Рё РёРіСЂР°Р»Р° РЅР° С„РѕСЂС‚РµРїРёР°РЅРѕ, РїСЂРёРЅРёРјР°Р»Р° СѓС‡Р°СЃС‚РёРµ РІ СЂР°Р·Р»РёС‡РЅС‹С… РїСЂРѕРµРєС‚Р°С… Рё РІС…РѕРґРёР»Р° РІРѕ РјРЅРѕРіРёРµ РјСѓР·С‹РєР°Р»СЊРЅС‹Рµ РєРѕР»Р»РµРєС‚РёРІС‹. РњРЅРѕРіРѕС‡РёСЃР»РµРЅРЅС‹Рµ РІС‹СЃС‚СѓРїР»РµРЅРёСЏ РїСЂРёРІРѕРґРёР»Рё РµРµ РІ СЂР°Р·РЅС‹Рµ СѓРіРѕР»РєРё РїР»Р°РЅРµС‚С‹ - РґР°Р¶Рµ РІ РђРІСЃС‚СЂР°Р»РёСЋ! РљРѕРіРґР° Сѓ РЅРµРµ РїРѕСЏРІР»СЏРµС‚СЃСЏ СЃРІРѕР±РѕРґРЅРѕРµ РІСЂРµРјСЏ РѕС‚ С€РєРѕР»С‹ Рё РјСѓР·С‹РєРё, РѕРЅР° СЃ РёРЅС‚РµСЂРµСЃРѕРј РёР·СѓС‡Р°РµС‚ Р°СЂС…РёС‚РµРєС‚СѓСЂСѓ Рё СЂРёСЃСѓРµС‚. РњР°РЅРЅ РҐРµР»СЊСЃС‚РµР№РЅ РёРіСЂР°РµС‚ РІ РіСЂСѓРїРїРµ РЅР° Р°Р»СЊС‚Рµ. РћРЅР° РЅР°С‡Р°Р»Р° Р·Р°РЅСЏС‚РёСЏ РёРіСЂС‹ РЅР° СЃРєСЂРёРїРєРµ РІ РІРѕР·СЂР°СЃС‚Рµ 10 Р»РµС‚. РќР° СЃРµРіРѕРґРЅСЏ, РІ РєР°СЂСЊРµСЂРµ 21-Р»РµС‚РЅРµР№ РњР°РЅРЅ - СѓС‡Р°СЃС‚РёРµ РІ СЂР°Р·Р»РёС‡РЅС‹С… РјРµР¶РґСѓРЅР°СЂРѕРґРЅС‹С… РѕСЂРєРµСЃС‚СЂР°С… Рё РІС‹СЃС‚СѓРїР»РµРЅРёСЏ РїРѕ РІСЃРµР№ Р•РІСЂРѕРїРµ. РџРѕРјРёРјРѕ СЌС‚РѕРіРѕ, РѕРЅР° СЃРµР№С‡Р°СЃ РёР·СѓС‡Р°РµС‚ РјРµРЅРµРґР¶РјРµРЅС‚ РІ РІРѕРїСЂРѕСЃР°С… РѕС…СЂР°РЅС‹ РѕРєСЂСѓР¶Р°СЋС‰РµР№ СЃСЂРµРґС‹. Р‘СЌРє-РІРѕРєР°Р»РёСЃС‚РєРµ РњР°СЂРёР»РёРЅ РљРѕРЅРіРѕ - 22 РіРѕРґР°. РћРЅР° РїСЂРёС€Р»Р° РІ РјСѓР·С‹РєСѓ РёР· С‚Р°РЅС†РµРІ, РєРѕС‚РѕСЂС‹РјРё РѕРЅР° Р·Р°РЅРёРјР°Р»Р°СЃСЊ СЃ 5 Р»РµС‚. Р’ РґРѕРїРѕР»РЅРµРЅРёРµ Рє СЌС‚РѕРјСѓ РѕРЅР° РІРѕРІР»РµС‡РµРЅР° Рё РІ РґСЂСѓРіРёРµ РјСѓР·С‹РєР°Р»СЊРЅС‹Рµ РїСЂРѕРµРєС‚С‹. 18-Р»РµС‚РЅСЏСЏ РњРёСЂСЊСЏРј РњРµСЃР°Рє С‚Р°РєР¶Рµ РёСЃРїРѕР»РЅРёС‚ Р±СЌРє-РІРѕРєР°Р». РћРЅР° Р°РєС‚РёРІРЅРѕ Р·Р°РЅРёРјР°РµС‚СЃСЏ РјСѓР·С‹РєРѕР№ СѓР¶Рµ 10 Р»РµС‚ Рё РІ РЅР°СЃС‚РѕСЏС‰РµРµ РІСЂРµРјСЏ РёР·СѓС‡Р°РµС‚ РєР»Р°СЃСЃРёС‡РµСЃРєРѕРµ РїРµРЅРёРµ Рё РіРѕС‚РѕРІРёС‚СЃСЏ Р·Р°РєРѕРЅС‡РёС‚СЊ С€РєРѕР»Сѓ. РњРёСЂСЊСЏРј РІРїРµСЂРІС‹Рµ РїРѕСЏРІРёР»Р°СЃСЊ РЅР° СЃС†РµРЅРµ Р•РІСЂРѕРІРёРґРµРЅРёСЏ РІ РІРѕР·СЂР°СЃС‚Рµ 12 Р»РµС‚, РєРѕРіРґР° РїСЂРёРЅРёРјР°Р»Р° СѓС‡Р°СЃС‚РёРµ РІ РёРЅС‚РµСЂРІР°Р»-Р°РєС‚Рµ Р•РІСЂРѕРІРёРґРµРЅРёСЏ 2002 РІ РўР°Р»Р»РёРЅРЅРµ. Р’ РҐРµР»СЊСЃРёРЅРєРё РІ 2006 РіРѕРґСѓ РњРёСЂСЊСЏРј РїРµР»Р° Р±СЌРє-РІРѕРєР°Р» РїСЂРµРґСЃС‚Р°РІРёС‚РµР»СЊРЅРёС†Рµ Р­СЃС‚РѕРЅРёРё Р“РµСЂР»Рё РџР°РґР°СЂ. РђРІС‚РѕСЂ РїРµСЃРЅРё, 36-Р»РµС‚РЅРёР№ РЎРІРµРЅ Р›С‹С…РјСѓСЃ - РѕРґРёРЅ РёР· РЅР°РёР±РѕР»РµРµ СѓСЃРїРµС€РЅС‹С… РєРѕРјРїРѕР·РёС‚РѕСЂРѕРІ Рё РїСЂРѕРґСЋСЃРµСЂРѕРІ РІ Р­СЃС‚РѕРЅРёРё. РћРЅ РІР»Р°РґРµРµС‚ СЃРѕР±СЃС‚РІРµРЅРЅС‹Рј Р»РµР№Р±Р»РѕРј Moonwalk. Р“СЂСѓРїРїР° Vanilla Ninja, СЃРѕР·РґР°РЅРЅР°СЏ РЎРІРµРЅРѕРј, РІС‹С€Р»Р° РЅР° Р•РІСЂРѕРїРµР№СЃРєРёР№ СѓСЂРѕРІРµРЅСЊ Рё РїСЂРёРЅРёРјР°Р»Р° СѓС‡Р°СЃС‚РёРµ РІ РєРѕРЅРєСѓСЂСЃРµ Р•РІСЂРѕРІРёРґРµРЅРёРµ 2005, РїСЂРµРґСЃС‚Р°РІР»СЏСЏ РЁРІРµР№С†Р°СЂРёСЋ. РЎРІРµРЅ РЅРµРѕРґРЅРѕРєСЂР°С‚РЅРѕ СѓС‡Р°СЃС‚РІРѕРІР°Р» РІ СЌСЃС‚РѕРЅСЃРєРёС… РѕС‚Р±РѕСЂР°С… РЅР° Р•РІСЂРѕРІРёРґРµРЅРёРµ Рё РµРіРѕ РїРµСЃРЅРё СЃС‚Р°РЅРѕРІРёР»РёСЃСЊ С„Р°РІРѕСЂРёС‚Р°РјРё Сѓ РїСѓР±Р»РёРєРё. Р’ 2005 РіРѕРґСѓ СЃ РµРіРѕ РїРµСЃРЅРµР№ "Let's Get Loud" РїРѕР±РµРґРёР»Р° РіСЂСѓРїРїР° Suntribe. РџСЂРѕСЃР»СѓС€Р°С‚СЊ РїРµСЃРЅСЋ RГ¤ndajad РІС‹ РјРѕР¶РµС‚Рµ Р·РґРµСЃСЊ Рё РїРѕСЃРјРѕС‚СЂРµС‚СЊ РїСЂРµРІСЊСЋ РІРёРґРµРѕ Р·РґРµСЃСЊ. Р’С‹СЃС‚СѓРїР»РµРЅРёРµ РЅР° С€РѕСѓ "Paar" РґРѕСЃС‚СѓРїРЅРѕ Р·РґРµСЃСЊ. "РњС‹ РІСЃРµ - РїСѓС‚РµС€РµСЃС‚РІРµРЅРЅРёРєРё Рё РїСЂРѕС…РѕРґРёРј С‡РµСЂРµР· СЃРѕР±СЃС‚РІРµРЅРЅС‹Р№ РІС‹Р±РѕСЂ", РѕРїРёСЃС‹РІР°РµС‚ РЎР°РЅРґСЂР° СЃРІРѕСЋ РїРµСЃРЅСЋ. - Hello, Sandra and Urban Symphony, and first of all our congratulations for being selected Estonian representative at Eurovision 2009! How do you feel now, being a Eurovision participant? - We are happy, that people gave us this honour to represent Estonia at the Eurovision Song Contest. We are really grateful! - How can you describe your song RГ¤ndajad in one phrase? - This is a song with a beautiful melody about travelling on your way. - The song has a very deep philosophical meaning; can you explain it more? - We all are wanderers searching for our way and to travel along this way; to learn and trying to understand this world and ourselves. - Together with Sven we have been writing demos for a year and decided to perform our first song at the Eesti Laul. We though that RГ¤ndajad was the most suitable. - So was it Sven LГµhmus, who suggested you to enter the national pre-selection? - We discussed which would be the best way to perform in front of the public and one of the ideas was Eesti Laul. This was SvenвЂ™s idea. This felt most suitable and when we learnt, that we are among the finalists, we were really happy. - Was it difficult to win Eesti Laul? - We gave our best and with the support from the jury and our listeners we won. The main thing was to give our best. - You have decided to perform song in Estonian at the contest, was it natural decision? - Yes. Estonian language is beautiful and RГ¤ndajad sounds in our mother tongue very good. - There are different versions of the song on our single, but they all are in Estonian. 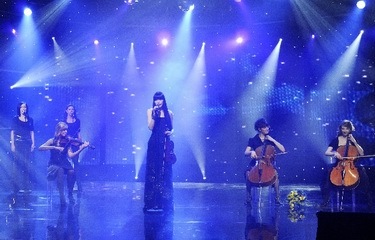 At the concerts we can perform the song also acoustically. - Do you have any plans to film a music video for your entry? - We will exclude nothing. At the moment we are concentrating to perform well. - Will the stage presentation of the entry in Moscow be similar to the one weвЂ™ve seen in Estonian NF? Or do you plan something extra for the international audience? - There have been good songs and performances on the Eurovision. Hopefully also this year! - To give a positive experience to the public by doing our best. - The base for success is dedication. I think the people will value the result after the semi-final. And when weвЂ™ll give our best and listeners will love it, then everything will be all right. - Music is the most important; the visual side should support the music. Thus the entirety is what counts вЂ“ to be professional both in music and in performance. - Eurovision is sometimes labelled as political contest. Do you think of it as political event? - We perform our music for the people. We donвЂ™t think about politics. - I think itвЂ™s positive, when a jury is made up of impartial people putting aside personal sympathies and nationalities and will judge the songs professionally taking into account other aspects. - I havenвЂ™t yet had time to listen to all other songs, only a couple of them. I loved the Norwegian entry. - Let's speak briefly on your career. Is Eurovision participation your main achievement so far, where there other major highlights? - Previously there have been different events and achievements, I have participated in many song contests and achieved good placements. But my main achievement is the possibility to be on stage and to perform. - Do you have some original songs in your repertoire as band, or do you mostly perform cover versions? - Urban SymphonyвЂ™s priority is to write songs and to perform them. Depending on a concert we could do also covers, but our main stress is on the original songs. - Do you have already plans to continue as band after the contest, are you preparing some releases? - We would like to thank all our supporters and listeners from the bottom of our heart! We wish you all the best! - Thank you for the interview, good luck with your preparations and see you in Moscow! - РџСЂРёРІРµС‚, РЎР°РЅРґСЂР° Рё Urban Symphony! РќР°С€Рё РїРѕР·РґСЂР°РІР»РµРЅРёСЏ СЃ С‚РµРј, С‡С‚Рѕ РІС‹ СЃС‚Р°Р»Рё РїСЂРµРґСЃС‚Р°РІРёС‚РµР»СЊРЅРёС†Р°РјРё Р­СЃС‚РѕРЅРёРё РЅР° Р•РІСЂРѕРІРёРґРµРЅРёРё 2009! Р§С‚Рѕ РІС‹ С‡СѓРІСЃС‚РІСѓРµС‚Рµ СЃРµР№С‡Р°СЃ, РїРѕРїР°РІ РЅР° СЌС‚РѕС‚ РєРѕРЅРєСѓСЂСЃ? - РњС‹ СЂР°РґС‹, С‡С‚Рѕ Р·СЂРёС‚РµР»Рё РґРѕРІРµСЂРёР»Рё РЅР°Рј С‚Р°РєСѓСЋ С‡РµСЃС‚СЊ - РїСЂРµРґСЃС‚Р°РІР»СЏС‚СЊ Р­СЃС‚РѕРЅРёСЋ РЅР° Р•РІСЂРѕРІРёРґРµРЅРёРё. РњС‹ РѕС‡РµРЅСЊ Р±Р»Р°РіРѕРґР°СЂРЅС‹! - РљР°Рє Р±С‹ РІС‹ РѕРїРёСЃР°Р»Рё СЃРІРѕСЋ РїРµСЃРЅСЋ RГ¤ndajad РІ РѕРґРЅРѕР№ С„СЂР°Р·Рµ? - Р­С‚Рѕ РїРµСЃРЅСЏ СЃ РєСЂР°СЃРёРІРѕР№ РјРµР»РѕРґРёРµР№ Рѕ РїСѓС‚РµС€РµСЃС‚РІРёРё СЃРІРѕРёРј РїСѓС‚РµРј. - Р’ РїРµСЃРЅРµ Р·Р°Р»РѕР¶РµРЅРѕ РЅРµРєРѕРµ С„РёР»РѕСЃРѕС„СЃРєРѕРµ РїРѕСЃР»Р°РЅРёРµ, РјРѕР¶РµС‚Рµ Р»Рё РІС‹ РѕР±СЉСЏСЃРЅРёС‚СЊ РµРіРѕ? - РњС‹ РІСЃРµ СЃС‚СЂР°РЅРЅРёРєРё, РєРѕС‚РѕСЂС‹Рµ РёС‰СѓС‚ СЃРІРѕР№ РїСѓС‚СЊ Рё РїСѓС‚РµС€РµСЃС‚РІСѓСЋС‚ РїРѕ СЌС‚РѕРјСѓ РїСѓС‚Рё, СЃ С†РµР»СЊСЋ СѓР·РЅР°С‚СЊ Рё РїРѕРїС‹С‚Р°С‚СЊСЃСЏ РїРѕРЅСЏС‚СЊ СЌС‚РѕС‚ РјРёСЂ Рё СЃР°РјРёС… СЃРµР±СЏ. - Р Р°СЃСЃРєР°Р¶РёС‚Рµ РЅР°Рј РІРєСЂР°С‚С†Рµ РёСЃС‚РѕСЂРёСЋ СЃРѕР·РґР°РЅРёСЏ СЌС‚РѕР№ РїРµСЃРЅРё? Р‘С‹Р»Р° Р»Рё РѕРЅР° РЅР°РїРёСЃР°РЅР° СЃРїРµС†РёР°Р»СЊРЅРѕ РґР»СЏ Р•РІСЂРѕРІРёРґРµРЅРёСЏ? - Р’РјРµСЃС‚Рµ СЃРѕ РЎРІРµРЅРѕРј РјС‹ Р·Р°РїРёСЃС‹РІР°Р»Рё СѓР¶Рµ РіРѕРґ РґРµРјРѕ СЂР°Р·Р»РёС‡РЅС‹С… РїРµСЃРµРЅ Рё РјС‹ СЂРµС€РёР»Рё, С‡С‚Рѕ РїРµСЂРІРѕРµ РЅР°С€Рµ РІС‹СЃС‚СѓРїР»РµРЅРёРµ РґРѕР»Р¶РЅРѕ СЃРѕСЃС‚РѕСЏС‚СЊСЃСЏ РЅР° Eesti Laul. Р� РјС‹ РїРѕРґСѓРјР°Р»Рё, С‡С‚Рѕ RГ¤ndajad РЅР°РёР±РѕР»РµРµ РїРѕРґС…РѕРґРёС‚ Рє РєРѕРЅРєСѓСЂСЃСѓ. - РўРѕ РµСЃС‚СЊ СЌС‚Рѕ РЎРІРµРЅ Р›С‹С…РјСѓСЃ РїСЂРµРґР»РѕР¶РёР» РІР°Рј РїСЂРёРЅСЏС‚СЊ СѓС‡Р°СЃС‚РёРµ РІ РѕС‚Р±РѕСЂРµ? - РњС‹ РѕР±СЃСѓР¶РґР°Р»Рё, РєР°Рє Р±С‹ РЅР°Рј Р»СѓС‡С€Рµ СЃС‚Р°СЂС‚РѕРІР°С‚СЊ, РіРґРµ Р±С‹ РІС‹СЃС‚СѓРїРёС‚СЊ РїРµСЂРµРґ РїСѓР±Р»РёРєРѕР№ Рё РЎРІРµРЅ РїСЂРµРґР»РѕР¶РёР» СЃРґРµР»Р°С‚СЊ СЌС‚Рѕ РёРјРµРЅРЅРѕ РЅР° Eesti Laul. РќР°Рј РїРѕРєР°Р·Р°Р»РѕСЃСЊ СЌС‚Рѕ РїРѕРґС…РѕРґСЏС‰РёРј Рё РјС‹ Р±С‹Р»Рё РѕС‡РµРЅСЊ СЂР°РґС‹, РєРѕРіРґР° СѓРІРёРґРµР»Рё СЃРµР±СЏ РІ СЃРїРёСЃРєРµ С„РёРЅР°Р»РёСЃС‚РѕРІ. - РўСЏР¶РµР»Рѕ Р»Рё Р±С‹Р»Рѕ РїРѕР±РµРґРёС‚СЊ РЅР° Eesti Laul? - РњС‹ РїРѕСЃС‚Р°СЂР°Р»РёСЃСЊ СЃРґРµР»Р°С‚СЊ РІСЃРµ РІРѕР·РјРѕР¶РЅРѕРµ Рё СЃРјРѕРіР»Рё Р·Р°РІРѕРµРІР°С‚СЊ РїРѕРґРґРµСЂР¶РєСѓ Р·СЂРёС‚РµР»РµР№ Рё Р¶СЋСЂРё. РЎР°РјРѕРµ РіР»Р°РІРЅРѕРµ Р±С‹Р»Рѕ РІР»РѕР¶РёС‚СЊ РІСЃРµС… СЃРµР±СЏ РІ СЌС‚Рѕ РІС‹СЃС‚СѓРїР»РµРЅРёРµ. - Р’С‹ СЂРµС€РёР»Рё СЃРїРµС‚СЊ РЅР° СЌСЃС‚РѕРЅСЃРєРѕРј РЅР° Р•РІСЂРѕРІРёРґРµРЅРёРё. Р‘С‹Р»Рѕ Р»Рё СЌС‚Рѕ Р»РµРіРєРёРј СЂРµС€РµРЅРёРµРј? - Р”Р°, РїРѕС‚РѕРјСѓ С‡С‚Рѕ СЌСЃС‚РѕРЅСЃРєРёР№ СЏР·С‹Рє РѕС‡РµРЅСЊ РєСЂР°СЃРёРІ Рё RГ¤ndajad РЅР° РЅР°С€РµРј СЂРѕРґРЅРѕРј СЏР·С‹РєРµ С‚РѕР¶Рµ Р·РІСѓС‡РёС‚ РѕС‡РµРЅСЊ С…РѕСЂРѕС€Рѕ. - РџР»Р°РЅРёСЂСѓРµС‚Рµ Р»Рё РІС‹ Р·Р°РїРёСЃР°С‚СЊ РЅРѕРІС‹Рµ РІРµСЂСЃРёРё СЌС‚РѕР№ РїРµСЃРЅРё, РЅР° РґСЂСѓРіРёС… СЏР·С‹РєР°С…, РёР»Рё СЂРµРјРёРєСЃС‹? - РќР° СЃРёРЅРіР» РІРѕС€Р»Рё РЅРµСЃРєРѕР»СЊРєРѕ СЂР°Р·РЅС‹С… РІРµСЂСЃРёР№ РЅР°С€РµР№ РїРµСЃРЅРё, РЅРѕ РІСЃРµ РѕРЅРё РЅР° СЌСЃС‚РѕРЅСЃРєРѕРј. РќР° РєРѕРЅС†РµСЂС‚Р°С… РјС‹ РµС‰Рµ РёСЃРїРѕР»РЅСЏРµРј Р°РєРєСѓСЃС‚РёС‡РµСЃРєСѓСЋ РІРµСЂСЃРёСЋ РЅР°С€РµР№ РєРѕРјРїРѕР·РёС†РёРё. - РџР»Р°РЅРёСЂСѓРµС‚Рµ Р»Рё РІС‹ СЃСЉРµРјРєРё РІРёРґРµРѕРєР»РёРїР° РЅР° РІР°С€Сѓ РїРµСЃРЅСЋ? - РњС‹ РЅРµ РёСЃРєР»СЋС‡Р°РµРј РЅРёС‡РµРіРѕ. РќРѕ РІ РЅР°СЃС‚РѕСЏС‰РµРµ РІСЂРµРјСЏ РјС‹ РєРѕРЅС†РµРЅС‚СЂРёСЂСѓРµРјСЃСЏ РЅР° РїРѕРґРіРѕС‚РѕРІРєРµ Рє РІС‹СЃС‚СѓРїР»РµРЅРёСЋ. - Р‘СѓРґРµС‚ Р»Рё РІР°С€Рµ СЃС†РµРЅРёС‡РµСЃРєРѕРµ РІС‹СЃС‚СѓРїР»РµРЅРёРµ РїРѕС…РѕР¶РёРј РЅР° С‚Рѕ, С‡С‚Рѕ РјС‹ РІРёРґРµР»Рё РЅР° СЌСЃС‚РѕРЅСЃРєРѕРј РѕС‚Р±РѕСЂРµ, РёР»Рё РІС‹ РїР»Р°РЅРёСЂСѓРµС‚Рµ РєР°РєРёРµ-С‚Рѕ РЅРѕРІРѕРІРІРµРґРµРЅРёСЏ РЅР° Р·Р°СЂСѓР±РµР¶РЅС‹С… Р·СЂРёС‚РµР»РµР№? - РЎР»РµРґРёС‚Рµ Р»Рё РІС‹ РѕР±С‹С‡РЅРѕ Р·Р° СЃР°РјРёРј Р•РІСЂРѕРІРёРґРµРЅРёРµРј? Р§С‚Рѕ РІС‹ РґСѓРјР°РµС‚Рµ РѕР± СЌС‚РѕРј С€РѕСѓ РІ РѕР±С‰РµРј? - РћР±С‹С‡РЅРѕ, РєР°Р¶РґС‹Р№ РіРѕРґ РЅР° Р•РІСЂРѕРІРёРґРµРЅРёРё РјРЅРѕРіРѕ С…РѕСЂРѕС€РёС… РїРµСЃРµРЅ. РќР°РґРµСЋСЃСЊ, С‡С‚Рѕ С‚Р°Рє РѕСЃС‚Р°РЅРµС‚СЃСЏ Рё РІ СЌС‚РѕРј РіРѕРґСѓ! - Р§С‚РѕР±С‹ РїСѓР±Р»РёРєР° РїРѕР»СѓС‡РёР»Р° СѓРґРѕРІРѕР»СЊСЃС‚РІРёРµ РѕС‚ РЅР°С€РµРіРѕ РІС‹СЃС‚СѓРїР»РµРЅРёСЏ, Р° РјС‹ РїРѕСЃС‚Р°СЂР°РµРјСЃСЏ СЃРґРµР»Р°С‚СЊ РІСЃРµ РѕС‚ РЅР°СЃ Р·Р°РІРёСЃСЏС‰РµРµ РґР»СЏ СЌС‚РѕРіРѕ. - Р’С‹ СЃС‡РёС‚Р°РµС‚Рµ РїСЂРѕРјРѕ-С‚СѓСЂ РІР°Р¶РЅС‹Рј РјРѕРјРµРЅС‚РѕРј РЅР° РїСѓС‚Рё Рє СѓСЃРїРµС…Сѓ РЅР° РєРѕРЅРєСѓСЂСЃРµ? РџР»Р°РЅРёСЂСѓРµС‚Рµ Р»Рё РїРѕСЃРµС‚РёС‚СЊ РґСЂСѓРіРёРµ СЃС‚СЂР°РЅС‹ РїРµСЂРµРґ РєРѕРЅРєСѓСЂСЃРѕРј? - РћСЃРЅРѕРІР° СѓСЃРїРµС…Р° - СЌС‚Рѕ РїСЂРµРґР°РЅРЅРѕСЃС‚СЊ СЃРІРѕРµРјСѓ РґРµР»Сѓ. РЇ РґСѓРјР°СЋ, С‡С‚Рѕ Р·СЂРёС‚РµР»Рё Р±СѓРґСѓС‚ РѕС†РµРЅРёРІР°С‚СЊ РЅРµРїРѕСЃСЂРµРґСЃС‚РІРµРЅРЅРѕ РІС‹СЃС‚СѓРїР»РµРЅРёСЏ РЅР° РїРѕР»СѓС„РёРЅР°Р»Рµ. Р� РµСЃР»Рё РјС‹ СЃРјРѕР¶РµРј РїРѕР»РЅРѕСЃС‚СЊСЋ РІС‹Р»РѕР¶РёС‚СЊСЃСЏ Рё РїРѕРЅСЂР°РІРёС‚СЊСЃСЏ Р·СЂРёС‚РµР»СЏРј, С‚Рѕ РІСЃРµ Р±СѓРґРµС‚ РІ РїРѕСЂСЏРґРєРµ. - РќР°РёР±РѕР»РµРµ РІР°Р¶РЅР° РјСѓР·С‹РєР°. Р’РёР·СѓР°Р»СЊРЅР°СЏ СЃС‚РѕСЂРѕРЅР° РґРѕР»Р¶РЅР° РїРѕРґРґРµСЂР¶РёРІР°С‚СЊ РјСѓР·С‹РєСѓ. РџРѕСЌС‚РѕРјСѓ РѕС‡РµРЅСЊ РІР°Р¶РЅРѕ РґРѕР±РёС‚СЊСЃСЏ С†РµР»РѕСЃС‚РЅРѕСЃС‚Рё - Р±С‹С‚СЊ РїСЂРѕС„РµСЃСЃРёРѕРЅР°Р»СЊРЅС‹РјРё РєР°Рє РІ РјСѓР·С‹РєРµ, С‚Р°Рє Рё РІ РІС‹СЃС‚СѓРїР»РµРЅРёРё. - Р�РЅРѕРіРґР° Рѕ Р•РІСЂРѕРІРёРґРµРЅРёРё РіРѕРІРѕСЂСЏС‚, С‡С‚Рѕ СЌС‚Рѕ РїРѕР»РёС‚РёС‡РµСЃРєРёР№ РєРѕРЅРєСѓСЂСЃ. Р’С‹ С‚Р°Рє СЃС‡РёС‚Р°РµС‚Рµ? - РњС‹ РёСЃРїРѕР»РЅСЏРµРј РЅР°С€Сѓ РјСѓР·С‹РєСѓ РґР»СЏ Р·СЂРёС‚РµР»РµР№. РњС‹ РЅРµ РґСѓРјР°РµРј Рѕ РїРѕР»РёС‚РёРєРµ. - Р’С‹ РѕС†РµРЅРёРІР°РµС‚Рµ РїРѕР·РёС‚РёРІРЅРѕ РІРѕР·РІСЂР°С‰РµРЅРёРµ РїСЂРѕС„РµСЃСЃРёРѕРЅР°Р»СЊРЅС‹С… Р¶СЋСЂРё? - Р”Р°, СЏ РґСѓРјР°СЋ, С‡С‚Рѕ СЌС‚Рѕ С…РѕСЂРѕС€РµРµ СЂРµС€РµРЅРёРµ, РєРѕРіРґР° Р¶СЋСЂРё СЃРѕСЃС‚РѕРёС‚ РёР· Р±РµСЃРїСЂРёСЃС‚СЂР°СЃС‚РЅС‹С… Р»СЋРґРµР№, РєРѕС‚РѕСЂС‹Р№ РѕСЃС‚Р°РІР»СЏСЋС‚ РІ СЃС‚РѕСЂРѕРЅРµ СЃРѕР±СЃС‚РІРµРЅРЅС‹Рµ СЃРёРјРїР°С‚РёРё Рё РЅР°С†РёРѕРЅР°Р»СЊРЅРѕСЃС‚Рё Рё РѕС†РµРЅРёРІР°СЋС‚ РїРµСЃРЅРё СЃ РїСЂРѕС„РµСЃСЃРёРѕРЅР°Р»СЊРЅРѕР№ С‚РѕС‡РєРё Р·СЂРµРЅРёСЏ, РїСЂРёРЅРёРјР°СЏ РІРѕ РІРЅРёРјР°РЅРёРµ РґСЂСѓРіРёРµ Р°СЃРїРµРєС‚С‹. - Р’С‹ СЃР»РµРґРёС‚Рµ Р·Р° РѕС‚Р±РѕСЂР°РјРё РґСЂСѓРіРёС… СЃС‚СЂР°РЅ, Р±СѓРґРµС€СЊ Р»Рё С‚С‹ СЃР»СѓС€Р°С‚СЊ Р·Р°СЂР°РЅРµРµ РІСЃРµ РєРѕРЅРєСѓСЂСЃРЅС‹Рµ РїРµСЃРЅРё? - РџРѕРєР° Сѓ РјРµРЅСЏ РЅРµ Р±С‹Р»Рѕ РІСЂРµРјРµРЅРё РїРѕСЃР»СѓС€Р°С‚СЊ РІСЃРµ РїРµСЃРЅРё, С‚РѕР»СЊРєРѕ РЅРµСЃРєРѕР»СЊРєРѕ РёР· РЅРёС…. РќРѕ РјРЅРµ РѕС‡РµРЅСЊ РїРѕРЅСЂР°РІРёР»Р°СЃСЊ РќРѕСЂРІРµР¶СЃРєР°СЏ РїРµСЃРЅСЏ. - Р”Р°РІР°Р№ РІРєСЂР°С‚С†Рµ РїРѕРіРѕРІРѕСЂРёРј Рѕ РІР°С€РµР№ РєР°СЂСЊРµСЂРµ. РљР°РєРёРј Р±С‹Р»Рѕ РµРµ РІС‹СЃС€РµРµ РґРѕСЃС‚РёР¶РµРЅРёРµ РґРѕ СѓС‡Р°СЃС‚РёСЏ РІ Р•РІСЂРѕРІРёРґРµРЅРёРё? - Р‘С‹Р»Рё Рё РґСЂСѓРіРёРµ РєРѕРЅРєСѓСЂСЃС‹, РіРґРµ СЏ Р·Р°РЅРёРјР°Р»Р° РІС‹СЃРѕРєРёРµ РјРµСЃС‚Р°, Р±С‹Р»Рё Рё РґСЂСѓРіРёРµ РґРѕСЃС‚РёР¶РµРЅРёСЏ. РќРѕ СЃР°РјРѕРµ РіР»Р°РІРЅРѕРµ РґРѕСЃС‚РёР¶РµРЅРёРµ - СЌС‚Рѕ РІРѕР·РјРѕР¶РЅРѕСЃС‚СЊ РІС‹С…РѕРґРёС‚СЊ РЅР° СЃС†РµРЅСѓ Рё РІС‹СЃС‚СѓРїР°С‚СЊ РЅР° РЅРµР№. - Р’ РіСЂСѓРїРїРµ Urban Symphony РІС‹ РІ РѕСЃРЅРѕРІРЅРѕРј РёСЃРїРѕР»РЅСЏРµС‚Рµ СЃРѕР±СЃС‚РІРµРЅРЅС‹Рµ РїРµСЃРЅРё РёР»Рё РєРѕРІРµСЂ РІРµСЂСЃРёРё? - РќР°С€ РїСЂРёРѕСЂРёС‚РµС‚ - СЌС‚Рѕ РЅР°РїРёСЃР°РЅРёРµ Рё РёСЃРїРѕР»РЅРµРЅРёРµ СЃРѕР±СЃС‚РІРµРЅРЅС‹С… РїРµСЃРµРЅ. Р’ Р·Р°РІРёСЃРёРјРѕСЃС‚Рё РѕС‚ РєРѕРЅС†РµСЂС‚Р° РјС‹ РјРѕР¶РµРј С‚Р°РєР¶Рµ РёСЃРїРѕР»РЅСЏС‚СЊ Рё РєРѕРІРµСЂ РІРµСЂСЃРёРё, РЅРѕ РІ РѕСЃРЅРѕРІРµ РЅР°С€РµРіРѕ С‚РІРѕСЂС‡РµСЃС‚РІР° РІСЃРµ СЂР°РІРЅРѕ Р»РµР¶Р°С‚ СЃРѕР±СЃС‚РІРµРЅРЅС‹Рµ РѕСЂРёРіРёРЅР°Р»СЊРЅС‹Рµ РєРѕРјРїРѕР·РёС†РёРё. - Р’С‹ РїР»Р°РЅРёСЂСѓРµС‚Рµ РїСЂРѕРґРѕР»Р¶РёС‚СЊ СЂР°Р±РѕС‚Сѓ РіСЂСѓРїРїРѕР№ РїРѕСЃР»Рµ Р•РІСЂРѕРІРёРґРµРЅРёСЏ, РіРѕС‚РѕРІРёС‚Рµ Р»Рё РІС‹ РєР°РєРёРµ-С‚Рѕ СЂРµР»РёР·С‹? - Р�, РЅР°РєРѕРЅРµС†, РµСЃР»Рё РІС‹ С…РѕС‚РёС‚Рµ С‡С‚Рѕ-С‚Рѕ РµС‰Рµ СЃРєР°Р·Р°С‚СЊ РїРѕСЃРµС‚РёС‚РµР»СЏРј РЅР°С€РµРіРѕ СЃР°Р№С‚Р°, С‚Рѕ РјРѕР¶РµС‚Рµ СЌС‚Рѕ СЃРґРµР»Р°С‚СЊ СЃРµР№С‡Р°СЃ. - РњС‹ Р±С‹ С…РѕС‚РµР»Рё РїРѕР±Р»Р°РіРѕРґР°СЂРёС‚СЊ РІСЃРµС… РЅР°С€РёС… СЃР»СѓС€Р°С‚РµР»РµР№ Рё РїРѕРєР»РѕРЅРЅРёРєРѕРІ РѕС‚ РІСЃРµРіРѕ СЃРµСЂРґС†Р°! Р’СЃРµРіРѕ РІР°Рј РЅР°РёР»СѓС‡С€РµРіРѕ! 22/04 For Urban Symphony, which will soon depart to Eurovision in Moscow, have been created new costumes. Scenography also will become more impressive. Composer Sven LГµhmus, who is now working on a CD of Laura PГµldvere which will be released in May, has promised that, compared to the show of the Urban Symphony at Eesti laul, their performance in the semifinal in Moscow will be slightly different. The changes will not affect the song itself, but first of all the costumes. В«This is certainlyВ», - he assured. The head of the team of LГµhmus at the Eurovision Tambet Mumma said the suits will certainly make a more joyful impression. В«Those that we saw at the Eesti laul, were too conservative. We will make them a little more playful, as the scene will be spacious and it will be important to attract attention in some way. Although there will be nothing very unusualВ», - he explained. There will be also changing in the lights. В«First of all, because the scene of a concert hall В«OlympicВ» is already lighted, it will be part of the background screen. There, to thebackground, it is possible to project the images so that the stage effects at this time would be quite powerful, but more detailed work on this still goes on. But the idea is there!В»- said LГµhmus and Mumma. Pyrotechnic effects are no planned, the motto is the taste. The Estonian delegation will leave for Moscow on 5th of May, report Postimees. Р”Р»СЏ Urban Symphony, РєРѕС‚РѕСЂС‹Рµ РѕС‚РїСЂР°РІСЏС‚СЃСЏ РЅР° Р•РІСЂРѕРІРёРґРµРЅРёРµ РІ РњРѕСЃРєРІСѓ, СѓР¶Рµ СЃРѕР·РґР°СЋС‚СЃСЏ РЅРѕРІС‹Рµ РєРѕСЃС‚СЋРјС‹. РЎС†РµРЅРѕРіСЂР°С„РёСЏ С‚Р°РєР¶Рµ РґРѕР»Р¶РЅР° СЃС‚Р°С‚СЊ Р±РѕР»РµРµ РІРїРµС‡Р°С‚Р»СЏСЋС‰РµР№. РљРѕРјРїРѕР·РёС‚РѕСЂ РЎРІРµРЅ Р›С‹С…РјСѓСЃ, РєРѕС‚РѕСЂС‹Р№ СЃРµР№С‡Р°СЃ СЂР°Р±РѕС‚Р°РµС‚ РЅР°Рґ РјСѓР·С‹РєРѕР№ РґР»СЏ РґРёСЃРєР° Р›Р°СѓСЂС‹ РџС‹Р»РґРІРµСЂРµ, РІС‹С…РѕРґСЏС‰РµРіРѕ РІ РјР°Рµ, РѕР±РµС‰Р°РµС‚, С‡С‚Рѕ РїРѕ СЃСЂР°РІРЅРµРЅРёСЋ СЃ С‚РµРј, С‡С‚Рѕ РїРѕРєР°Р·Р°Р»Рё Urban SymВ­phony РЅР° РєРѕРЅРєСѓСЂСЃРµ Eesti laul, РІС‹СЃС‚СѓРїР»РµРЅРёРµ РёС… РІ РњРѕСЃРєРІРµ РІРѕ РІС‚РѕСЂРѕРј РїРѕР»СѓС„РёРЅР°Р»Рµ Р•РІСЂРѕРІРёРґРµРЅРёСЏ Р±СѓРґРµС‚ РЅРµСЃРєРѕР»СЊРєРѕ РёРЅС‹Рј. Р�Р·РјРµРЅРµРЅРёСЏ РєРѕСЃРЅСѓС‚СЃСЏ РЅРµ С„РѕРЅРѕРіСЂР°РјРјС‹ РёР»Рё СЃР°РјРѕР№ РїРµСЃРЅРё, РЅРѕ РІ РїРµСЂРІСѓСЋ РѕС‡РµСЂРµРґСЊ РєРѕСЃВ­С‚СЋРјРѕРІ. В«Р­С‚Рѕ СѓР¶ С‚РѕС‡РЅРѕВ», вЂ” Р·Р°РІРµСЂРёР» РѕРЅ. Р СѓРєРѕРІРѕРґРёС‚РµР»СЊ РєРѕРјР°РЅРґС‹ Р›С‹С…РјСѓСЃР° РЅР° Р•РІСЂРѕРІРёРґРµРЅРёРё РўР°РјР±РµС‚ РњСѓРјРјР° СЃРєР°Р·Р°Р», С‡С‚Рѕ РєРѕСЃС‚СЋРјС‹ РЅРµРїСЂРµРјРµРЅРЅРѕ РїСЂРѕРёР·РІРµРґСѓС‚ Р±РѕР»РµРµ СЂР°РґРѕСЃС‚РЅРѕРµ РІРїРµС‡Р°С‚Р»РµРЅРёРµ. В«РўРµ, С‡С‚Рѕ РјС‹ РІРёРґРµР»Рё РЅР° EesВ­ti laul, Р±С‹Р»Рё С‡РµСЂРµСЃС‡СѓСЂ РєРѕРЅСЃРµСЂРІР°С‚РёРІРЅС‹. РњС‹ СЃРґРµР»Р°РµРј РёС… РЅРµСЃРєРѕР»СЊРєРѕ Р±РѕР»РµРµ РёРіСЂРёРІС‹РјРё, РїРѕСЃРєРѕР»СЊРєСѓ СЃС†РµРЅР° Р±СѓРґРµС‚ РїСЂРѕСЃВ­С‚РѕСЂРЅРµР№ Рё РЅР°РґРѕ РєР°Рє-С‚Рѕ РїСЂРёРІР»РµС‡СЊ РІРЅРёРјР°РЅРёРµ. РҐРѕС‚СЏ РЅРёС‡РµРіРѕ СЃРѕРІРµСЂС€РµРЅРЅРѕ РЅРµРѕР±С‹РєРЅРѕРІРµРЅРЅРѕРіРѕ РЅРµ Р±СѓРґРµС‚В», вЂ” РїРѕСЏСЃРЅРёР» РѕРЅ. Р�Р·РјРµРЅРёС‚СЃСЏ Рё РїРѕСЃС‚Р°РЅРѕРІРєР° СЃРІРµС‚Р°. В«Р’Рѕ-РїРµСЂРІС‹С…, РїРѕС‚РѕРјСѓ, С‡С‚Рѕ СЃС†РµРЅР° РєРѕРЅС†РµСЂС‚РЅРѕРіРѕ Р·Р°Р»Р° В«РћР»РёРјРїРёР№СЃРєРёР№В» СѓР¶Рµ РѕСЃРІРµС‰РµРЅР°, СЌС‚Рѕ С‡Р°СЃС‚СЊ С„РѕРЅРѕРІРѕРіРѕ СЌРєСЂР°РЅР°. РўСѓРґР°, РєР°Рє РЅР° С„РѕРЅ, РјРѕР¶РЅРѕ РїСЂРѕРµС†РёСЂРѕРІР°С‚СЊ РёР·РѕР±СЂР°Р¶РµРЅРёРµ, С‚Р°Рє С‡С‚Рѕ СЃС†РµРЅРёС‡РµСЃРєРёРµ СЌС„С„РµРєС‚С‹ РЅР° СЃРµР№ СЂР°Р· Р±СѓРґСѓС‚ РґРѕРІРѕР»СЊРЅРѕ РјРѕС‰РЅС‹РјРё, РѕРґРЅР°РєРѕ Р±РѕР»РµРµ РґРµС‚Р°Р»СЊРЅР°СЏ СЂР°Р±РѕС‚Р° РЅР°Рґ СЌС‚РёРј РµС‰Рµ РёРґРµС‚. Рђ РёРґРµСЏ РёРјРµРµС‚СЃСЏ!В» вЂ” Р·Р°СЏРІРёР»Рё Р›С‹С…РјСѓСЃ Рё РњСѓРјРјР°. РџРёСЂРѕС‚РµС…РЅРёС‡РµСЃРєРёРµ СЌС„С„РµРєС‚С‹ РЅРµ РїР»Р°РЅРёСЂСѓСЋС‚СЃСЏ, РґРµРІРёР·РѕРј СЏРІР»СЏРµС‚СЃСЏ РІРєСѓСЃ. Р”РµР»РµРіР°С†РёСЏ Р­СЃС‚РѕРЅРёРё РѕС‚РїСЂР°РІРёС‚СЃСЏ РІ РњРѕСЃРєРІСѓ 5 РјР°СЏ, СЃРѕРѕР±С‰Р°РµС‚ Postimees. Lead singer of the band Urban Symphony, which will represent Estonia at Eurovision, said in an interview to Radio Elmar, that the song, which won the national competition, will not undergo significant changes and will remain in the Estonian language, reports Postimees. 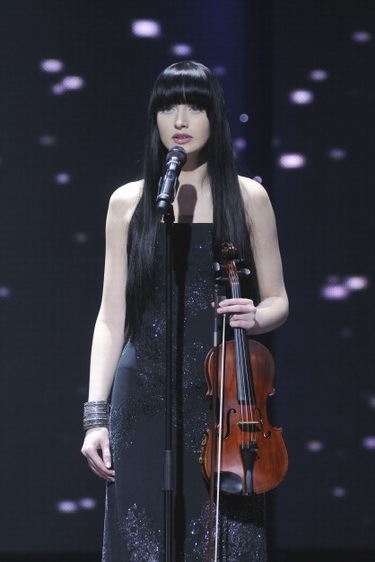 "In my opinion, Estonian is beautiful language, and song sounds perfectly in it", - said Sandra. Sandra did not comment on the projections of "eurofans", who are all predicting qualification to the finals: "The forecasts are not important, the main thing is to think about the song and try to transfer it from the heart to the hearts of listeners". The girl admitted that the song "Randajad" will not be last for the band and they have some idea of the development of the project upon the return from Moscow. Sandra also stated that it is wrong to promote music project through rumors about the personal life: "I guess their music may be not good enough, as some have to use their private life". РЎРѕР»РёСЃС‚РєР° РіСЂСѓРїРїС‹ Urban Symphony, РєРѕС‚РѕСЂР°СЏ Р±СѓРґРµС‚ РїСЂРµРґСЃС‚Р°РІР»СЏС‚СЊ Р­СЃС‚РѕРЅРёСЋ РЅР° Р•РІСЂРѕРІРёРґРµРЅРёРё, СЃРєР°Р·Р°Р»Р° РІ РёРЅС‚РµСЂРІСЊСЋ СЂР°РґРёРѕ Elmar, С‡С‚Рѕ РїРµСЃРЅСЏ, РїРѕР±РµРґРёРІС€Р°СЏ РІ РЅР°С†РёРѕРЅР°Р»СЊРЅРѕРј РєРѕРЅРєСѓСЂСЃРµ, РЅРµ РїСЂРµС‚РµСЂРїРёС‚ Р·РЅР°С‡РёС‚РµР»СЊРЅС‹С… РёР·РјРµРЅРµРЅРёР№ Рё РѕСЃС‚Р°РЅРµС‚СЃСЏ РЅР° СЌСЃС‚РѕРЅСЃРєРѕРј СЏР·С‹РєРµ, СЃРѕРѕР±С‰Р°РµС‚ Postimees. "РџРѕ-РјРѕРµРјСѓ, СЌСЃС‚РѕРЅСЃРєРёР№ - РєСЂР°СЃРёРІС‹Р№ СЏР·С‹Рє, Рё РЅР° РЅРµРј РїРµСЃРЅСЏ РїСЂРµРєСЂР°СЃРЅРѕ Р·РІСѓС‡РёС‚", - СЃРєР°Р·Р°Р»Р° РЎР°РЅРґСЂР°. РЎР°РЅРґСЂР° РЅРµ СЃС‚Р°Р»Р° РєРѕРјРјРµРЅС‚РёСЂРѕРІР°С‚СЊ РїСЂРѕРіРЅРѕР·С‹ "РµРІСЂРѕС„Р°РЅР°С‚РѕРІ", РєРѕС‚РѕСЂС‹Рµ РІ РѕРґРёРЅ РіРѕР»РѕСЃ РїСЂРµРґСЃРєР°Р·С‹РІР°СЋС‚ Р­СЃС‚РѕРЅРёРё РїРѕРїР°РґР°РЅРёРµ РІ С„РёРЅР°Р»: "РџСЂРѕРіРЅРѕР·С‹ РЅРµ РіР»Р°РІРЅРѕРµ, РіР»Р°РІРЅРѕРµ РґСѓРјР°С‚СЊ Рѕ РїРµСЃРЅРµ Рё РїРѕСЃС‚Р°СЂР°С‚СЊСЃСЏ РїРµСЂРµРґР°С‚СЊ РµРµ РѕС‚ СЃРµСЂРґС†Р° Рє СЃРµСЂРґС†Сѓ СЃР»СѓС€Р°С‚РµР»СЋ". Р”РµРІСѓС€РєР° РїСЂРёР·РЅР°Р»Р°СЃСЊ, С‡С‚Рѕ РїРµСЃРЅСЏ "Randajad" РЅРµ СЃС‚Р°РЅРµС‚ РґР»СЏ РєРѕР»Р»РµРєС‚РёРІР° РїРѕСЃР»РµРґРЅРµР№ Рё Сѓ РЅРёС… СѓР¶Рµ РµСЃС‚СЊ РЅРµРєРёРµ РёРґРµРё СЂР°Р·РІРёС‚РёСЏ РїСЂРѕРµРєС‚Р° РїРѕ РІРѕР·РІСЂР°С‰РµРЅРёСЋ РёР· РњРѕСЃРєРІС‹. РЎР°РЅРґСЂР° С‚Р°РєР¶Рµ Р·Р°СЏРІРёР»Р°, С‡С‚Рѕ СЃС‡РёС‚Р°РµС‚ РЅРµРїСЂР°РІРёР»СЊРЅС‹Рј СЂР°СЃРєСЂСѓС‡РёРІР°С‚СЊ РјСѓР·С‹РєР°Р»СЊРЅС‹Р№ РїСЂРѕРµРєС‚ Р·Р° СЃС‡РµС‚ СЃРїР»РµС‚РµРЅ Рѕ Р»РёС‡РЅРѕР№ Р¶РёР·РЅРё: "РќР°РІРµСЂРЅРѕ РјСѓР·С‹РєР° РЅРµ РґРѕСЃС‚Р°С‚РѕС‡РЅРѕ С…РѕСЂРѕС€Р°, СЂР°Р· РЅРµРєРѕС‚РѕСЂС‹Рј РїСЂРёС…РѕРґРёС‚СЃСЏ СЃРІРѕСЋ Р»РёС‡РЅСѓСЋ Р¶РёР·РЅСЊ РёСЃРїРѕР»СЊР·РѕРІР°С‚СЊ". Entries of Estonian preselection have been published by ETV online. Watch first presentation videos here. РџРµСЃРЅРё Р­СЃС‚РѕРЅСЃРєРѕРіРѕ РѕС‚Р±РѕСЂР° Р±С‹Р»Рё РѕРїСѓР±Р»РёРєРѕРІР°РЅС‹ ETV РѕРЅР»Р°Р№РЅ. РЎРјРѕС‚СЂРёС‚Рµ РїРµСЂРІСѓСЋ РІРёРґРµРѕ-РїСЂРµР·РµРЅС‚Р°С†РёСЋ РїРµСЃРµРЅ Р·РґРµСЃСЊ. 11/12 The list of the entries in the final of Estonian preselection Eesti Laul 2009 has been revealed today. Preselection jury included composer Timo Steiner, radio DJ Owe Petersell, journalist Siim Nestor, radio DJ Toomas Puna, radio DJ Erik Morna, MTV Estonia Ingrid Kohtla, producer Kaupo Karelson, journalist Valner Valme, musician Sten Sheripov, radio DJ Koit Raudsepp, tour manager Helen Sildna. 10 songs will take part in final, scheduled for 7th of March. Previews will be held for the preceeding month, starting February 7th. Best 2 songs will compete in superfinal on the same night. 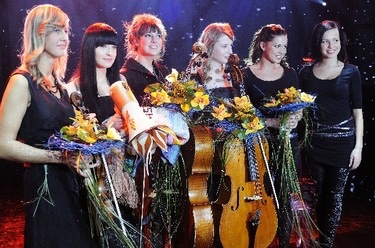 Р‘С‹Р» РїСЂРµР·РµРЅС‚РѕРІР°РЅ СЃРїРёСЃРѕРє СѓС‡Р°СЃС‚РЅРёРєРѕРІ Р­СЃС‚РѕРЅСЃРєРѕРіРѕ РѕС‚Р±РѕСЂР° Eesti Laul 2009. РћС‚Р±РѕСЂРѕС‡РЅРѕРµ Р¶СЋСЂРё РІРєР»СЋС‡Р°Р»Рѕ РІ СЃРµР±СЏ РєРѕРјРїРѕР·РёС‚РѕСЂР° Timo Steiner, РІРµРґСѓС‰РµРіРѕ Owe Petersell, Р¶СѓСЂРЅР°Р»РёСЃС‚Р° Siim Nestor, РІРµРґСѓС‰РµРіРѕ Toomas Puna, РІРµРґСѓС‰РµРіРѕ Erik Morna, РїСЂРµРґСЃС‚Р°РІРёС‚РµР»СЏ MTV Estonia Ingrid Kohtla, РїСЂРѕРґСЋСЃРµСЂР° Kaupo Karelson, Р¶СѓСЂРЅР°Р»РёСЃС‚Р° Valner Valme, РјСѓР·С‹РєР°РЅС‚Р° Sten Sheripov, РІРµРґСѓС‰РµРіРѕ Koit Raudsepp, С‚СѓСЂ-РјРµРЅРµРґР¶РµСЂР° Helen Sildna. Р¤РёРЅР°Р» РёР· 10 РїРµСЃРµРЅ СЃРѕСЃС‚РѕРёС‚СЃСЏ 7РіРѕ РјР°СЂС‚Р°, РїСЂРµРІСЊСЋ РїРµСЃРµРЅ Р±СѓРґРµС‚ РїСЂРѕС…РѕРґРёС‚СЊ РІ С‚РµС‡РµРЅРёРё РїСЂРµРґС€РµСЃС‚РІСѓСЋС‰РµРіРѕ РјРµСЃСЏС†Р°, РЅР°С‡РёРЅР°СЏ СЃ 7РіРѕ С„РµРІСЂР°Р»СЏ. Р›СѓС‡С€РёРµ 2 РїРµСЃРЅРё РїСЂРёРјСѓС‚ СѓС‡Р°СЃС‚РёРµ РІ РїРѕР»СѓС„РёРЅР°Р»Рµ РІ С‚РѕС‚ Р¶Рµ РІРµС‡РµСЂ. 08/12 110 songs have been submitted to the Estonian ESC preselection, compared to last years 58. It is expected that list of 10 finalists will be announced on Thursday evening show Paar. Meanwhile, tomorrow we're expecting the revelation of the participating songs in Latvia. 110 Р·Р°СЏРІРѕРє РїРѕСЃС‚СѓРїРёР»Рѕ РЅР° СѓС‡Р°СЃС‚РёРµ РІ РЅР°С†РёРѕРЅР°Р»СЊРЅРѕРј СЌСЃС‚РѕРЅСЃРєРѕРј РѕС‚Р±РѕСЂРµ РЅР° Р•РІСЂРѕРІРёРґРµРЅРёРµ, РїРѕ СЃСЂР°РІРЅРµРЅРёСЋ СЃ 58 РІ РїСЂРѕС€Р»РѕРј РіРѕРґСѓ. РћР¶РёРґР°РµС‚СЃСЏ, С‡С‚Рѕ СЃРїРёСЃРѕРє 10 С„РёРЅР°Р»РёСЃС‚РѕРІ Р±СѓРґРµС‚ РѕР±СЉСЏРІР»РµРЅ РІ С‡РµС‚РІРµСЂРі РІРµС‡РµСЂРѕРј РІРѕ РІСЂРµРјСЏ С€РѕСѓ Paar. РўРµРј РІСЂРµРјРµРЅРµРј, Р·Р°РІС‚СЂР° РјС‹ РѕР¶РёРґР°РµРј РѕР±СЉСЏРІР»РµРЅРёРµ СЃРїРёСЃРєР° СѓС‡Р°СЃС‚РІСѓСЋС‰РёС… РїРµСЃРµРЅ РІ Р›Р°С‚РІРёРё. Heidi Purga, director of Raadio2, appointed new producer of Estonian "Eesti laul 2009" (replacing Eurolaul as ESC preselection). Contest is open to Estonian residents only. Submission deadline is 8th of December. 10 songs will take part in final, scheduled for 7th of March. Previews will be held for the preceeding month. Best 2 songs will compete in superfinal on the same night. РҐРµР№РґРё РџСѓСЂРіР°, РіР»Р°РІРЅС‹Р№ СЂРµРґР°РєС‚РѕСЂ Raadio2, РЅР°Р·РЅР°С‡РµРЅР° РЅРѕРІС‹Рј РїСЂРѕРґСЋСЃРµСЂРѕРј Р­СЃС‚РѕРЅСЃРєРѕРіРѕ "Eesti Laul 2009" (Р·Р°РјРµРЅРёРІС€РµРіРѕ Eurolaul РІ РєР°С‡РµСЃС‚РІРµ РѕС‚Р±РѕСЂР° РЅР° Р•РІСЂРѕРІРёРґРµРЅРёРµ). РћС‚Р±РѕСЂ РѕС‚РєСЂС‹С‚ РґР»СЏ СЂРµР·РёРґРµРЅС‚РѕРІ Р­СЃС‚РѕРЅРёРё, РєСЂР°Р№РЅРёР№ СЃСЂРѕРє РїРѕРґР°С‡Рё Р·Р°СЏРІРѕРє - 8 РґРµРєР°Р±СЂСЏ. Р¤РёРЅР°Р» РёР· 10 РїРµСЃРµРЅ СЃРѕСЃС‚РѕРёС‚СЃСЏ 7РіРѕ РјР°СЂС‚Р°, РїСЂРµРІСЊСЋ РїРµСЃРµРЅ Р±СѓРґРµС‚ РїСЂРѕС…РѕРґРёС‚СЊ РІ С‚РµС‡РµРЅРёРё РїСЂРµРґС€РµСЃС‚РІСѓСЋС‰РµРіРѕ РјРµСЃСЏС†Р°. Р›СѓС‡С€РёРµ 2 РїРµСЃРЅРё РїСЂРёРјСѓС‚ СѓС‡Р°СЃС‚РёРµ РІ РїРѕР»СѓС„РёРЅР°Р»Рµ РІ С‚РѕС‚ Р¶Рµ РІРµС‡РµСЂ.